“We are first and foremost a real estate and technology company,” said Matt Chapdelaine, CEO of HerbFront. HerbFront is located in Chicago, but it currently serves clients in 10 states, helping dispensaries and cultivation centers find a legal property for their business. 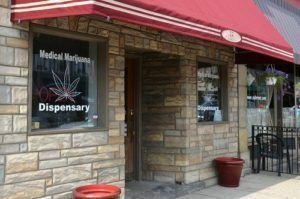 On November 9, the first medical cannabis stores opened their doors in Illinois. The application process started about a year ago, and not long after, Chapdelaine noticed the challenge of finding commercial real estate within the parameters of zoning and legislation guidelines. Coming from a background in technology and commercial real estate, HerbFront was founded to assist cannabis growers in finding a safe and legal property. Just as you would use a property search engine to find a home or an apartment that fits within specific criteria, the HerbFront platform sifts through data to pull up properties that are zoned for legal cannabis activity. Chapdelaine says the data received comes from a few different levels. The actual legislation from the state and sometimes on a county level sets parameters, which the team must meticulously run through because each location HerbFront serves is different. There is also data that the company must create on its own. Other data is purchased from a third-party provider. Chapdelaine says the formula is similar to what property managers, owners and developers look to when building a new apartment complex or restaurant. How close is public transportation or parks? The data changes, but the idea stays the same. But unlike some property management and real estate platforms, there are no add-on services like advertising or marketing. The idea for HerbFront goes back to the realization that compliant properties often sell way above their market value simply because of the inefficiencies and challenges in finding them. The platform also funnels out areas in order to avoid “clustering,” or recommending too many cannabis locations near one another. Whole block sections are taken off the map when a compliant property is purchased for medicinal or recreational purposes. HerbFront’s predictive map and zoning technology is key in this quickly shifting market. Chapdelaine said there’s a huge challenge in finding a property that is not only in an ideal location where people can get to it, but is also in a sweet spot far enough away from daycare centers, schools and churches. The predictive map and zoning technology helps to give HerbFront clients an idea of what the future holds if certain legislation passes. Chapdelaine says the company regularly gets calls to expand into different states that are in the midst of legalizing medicinal or recreational use.